We started out with a 200 year-old farmhouse which had been uninhabited for 50 years and made it into a four-star-rated, family-friendly, cozy and cheerful place!. It comprises a house for six (with three bedrooms upstairs in the former hay loft) and the former barn which now houses a swimming-pool and a separate apartment for two, complete with its bathroom and kitchenette. A couple occupying the apartment will be very close, but independent. You will have fun in your private covered pool with secure access which has views to the countryside and is heated from April to the end of October. Lounging on the sunny terraces is also a recommended activity! We have decorated the place with French furniture, some antique, to make it a warm and happy place where families and friends will have a good time together. You can share a meal on the solid farm table in the kitchen or on the terrace outside (South) or enjoy parasol and lounge chairs on the other terrace (West). 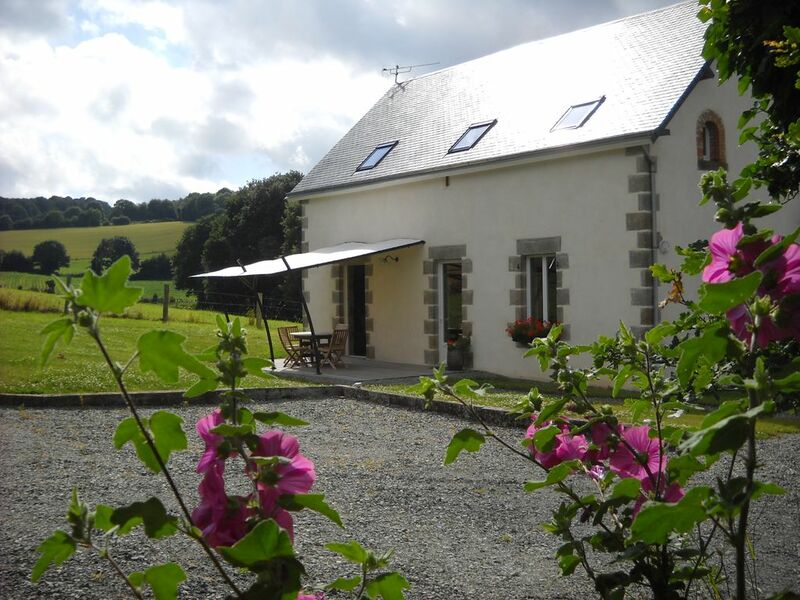 The gite is open year-round and we have installed solar panels and heat pumps to make it energy neutral. We are a little over two hours from Paris, but La Bellaziere is immersed in the countryside ! No close neighbors, only some local cows may show some curiosity … The place is very safe for children (first small road is about 200m). 50 meters from the gate starts a local walking path “Le sentier du Bel Air” which will lead you past superb views changing according to the seasons. Why La Bellaziere? because we love restoring old houses! We had been looking for a good candidate for a couple of years, not far from our home, and when we saw it, abandoned and unimproved, we could not resist! What we saw instantly was the lovely views, the privacy, the barn building which could house the swimming-pool ... and a charming house which was begging to be given a second life and resonate with the laughter of happy people! toilet, shower, Upstairs, one shower room with toilet, + separate toilet.. Very comfortable under-floor heating by heat-pump. Three to four cars may be parked inside. For stays of a minimum of a week (except swimming-pool towels). Can be rented for shorter stays. 2 gas, 2 induction plates. Three. One drip-coffee, one expresso machine (2 cups), one little Italian coffee pot. Basic salt, sugar etc. Rolls of toilet paper are provided in each bathroom. A complete selection in the main kitchen, basic in the apartment. Dining table can be set in the kitchen, dining-room, or outside on the terrace. Small selection of toys and children's books. Small balcony accessible from East bedroom. Can be provided on request. 10neuro charge/ bicycle. Dimensions 6m x 3,5m . Depth : 1,33m Heated from beg. of April to end of September. Minimum temperature : 75°F Usually heated at 28 degrees C. Secured access for children. No neighbors! Very private. A well-maintained walking-path starts at about 100m from the gate. End-of-stay cleaning is offered at 95 euros. Peace and quiet in a very comfortable rural gite. We had three very enjoyable weeks here with family from ages 4 to 73 staying at various stages of the holiday. All enjoyed it; the pool, small but refreshing, the surrounding countryside, the nearby lake with its beach and much more, walks in the forest and visiting some lovely villages not too far away. The house was quite well equipped with space for all to spread out. I would highly recommend you consider booking this cottage .It has been tastefully restored to a very high standard.All rooms are spacious comfortable and immaculate.We were a party of 3 adults and 2 boys aged 9 and 11.the location is rural and tranquil.Don`t be put off by this as there are lots of beautiful chateaus,historical landmarks,childrens activities within comfortable reach so you get the best of both worlds.Sylvaine gave us a warm welcome/very attentive but was unobtrusive.Good access to supermarkets/restaurants and markets for local produce.Would urge mummies and daddies to nab the poolside accommodation .Pictures of property really can`t capture how beautiful this place is. Superb value for money.The heated indoor swimming pool was enjoyed by all,especially the boys.We will be back.Thank-you Sylvaine for enabling us to have our best family holiday to date. Il faudra revenir nous voir! Si vous avez aimé en hiver, vous adorerez quand il fait beau!! Nous avons passé un week-end agréable entre amis et en famille. Nous avons trouvé une maison grande, propre avec beaucoup de cachet. Les enfants ont pu pleinement profiter du grand jardin et de la piscine couverte et chauffée. L'accueil a été chaleureux et les propriétaires tout à fait arrangeants. Nous avons été heureux de vous faire plaisir, revenez nous voir quand vous voulez, vous serez les bienvenus! Gite tres agreable,proprietaire tres disponible ,arrangeante,et aux petits soins...gite tres fonctionnel,aeré,spacieux. La piscine chauffé est un vrai plus,(les enfants ne parlent que de ca) elle est tres agreable,batiment exterieur a la maison où il y a un studio independant tres pratique pour un couple sans enfants. Les chambres st grandes. L endroit est tres reposant ,tres calme et avec une superbe vue. Nous sommes très heureux que vous ayez bien profité de votre week-end! Revenez quand vous voudrez, cela nous fera très plaisir! A rental contract will be sent. Everything is included in the price for a one-week minimum stay : bed linen, towels and kitchen linen will be provided. Beds will be made on arrival. For week-ends and short stays, rental of linen is possible but charged extra. (Linge inclus pour des séjours d'une semaine minimum, pour week-ends et courts séjours, nous contacter). All amenities included. Swimming-pool heated from April to end of October. ( Charges incluses, piscine chauffée d'Avril à Octobre. Temp minimum 24°). The swimming-pool will be heated to a minimum temperature of 24°. Final cleaning is priced at 95€. (Forfait ménage: 95€).